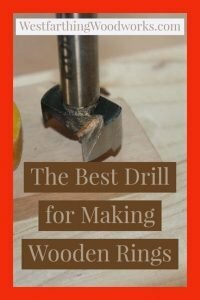 This post will reveal the best drill type for making wooden rings. There are several different ways that drill bits are made. 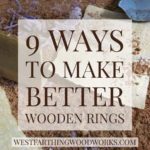 Not all of them are created equal, and for making wooden rings there is one that is the clear winner for several reasons. The most important aspect of a wooden ring is the finger opening. Even the best design in the world will never be worn more than a few times if the fit is poor. 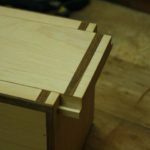 When you build your wooden rings, you need to pay really close attention to the fit, and that means the drill that you use for the finger hole. For sizing, there is a chart you can use from my post on Sizing a Wooden Ring, and it will help you convert common ring sizes into drill sizes. 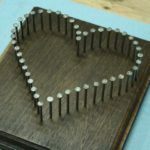 After that, come back and you will learn why one kind of drill stands out among the rest as your best choice for making wooden rings. There are a lot of drill bits in the world. They all essentially do the same thing, but the way that the manufacturer accomplishes it is different. A drill is just a way of making a hole, and there are several different styles of making that hole. The most common is the twist bit. This is the common spiral looking bit that you probably think of then you think of a drill bit. Then there are brad point bits, which is essentially a twist bit with a point at the middle to help with tracking. This is a common problem with twist bits, and the brad point helps the bit go where you want it to go. Another type is the spade or paddle bit. This is a wide flat bit that is used to drill holes of a larger diameter. They come in a number of sizes, and in the beginning can be a less expensive alternative for drilling your finger openings. 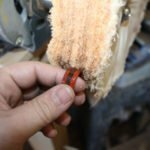 For more, my post on 35 Important Tips on How to Make a Ring is packed with several more ways for you to make better rings. With all the drill bits in the world, the kind of ring making drills is the Forster bit. This is drill looks like a metal puck on the end of a shaft, and it has a few different cutting edges depending on the design. These bits can come in inexpensive models, as well as some that seem like you can buy an entire kit for the same price as a single drill. The choice is yours, and I recommend going for the middle of the line when it comes to price. The bit is turned just the same as any other, and they are made to fit in common drill chucks, no matter the diameter of the hole they drill. They are easy to use, and if you can use any other drill, you can use the Forster just the same. Why is a Forster Bit Better? A Forster bit has several advantages over other bit types. This is why it is the best bit for making wooden rings. The advantages are also not locked out by price, because you can get Forster bits for about the same price as nicer standard drills. First, a Forster bit goes where you want it to. Twist bits tend to wander. Forster bits have a center spur that grabs the wood and tracks the bit. If you have ever tried to drill a precision hole with a large twist bit, you know how hard it is to make the bit go where you want. Next, Forster bits leave clean holes with smooth sides. The last thing you want to do is have to sand the inside or your wooden ring for days. A Forster bit minimizes the roughness, and makes the sanding process really fast. Finally, a Forster bit can get you into ring making without spending a fortune. Twist drills in large diameters are expensive. They are many times more expensive than Forster bits, and they are also not as good at drilling a clean hole. 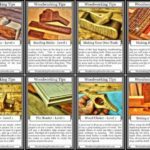 Recommended For You: A Beginners Guide to Woodworking, my new book designed to help you become a better woodworker. Forster bits are common items, and you can find them everywhere just about. In hardware stores and home improvement stores you can look in the drill section and many times there are kits as well as singles for sale. In fine woodworking stores you will find more variety, as well as a few different lines that give you options for price and quality. Again, shoot for the middle price range and you will get the best bang for your buck. Another option is online, and you can get deals on Forster bits there too. Many times, the prices online are better, because there is more competition. You can literally shop anywhere in the world from your computer, so you get far more options. Your homework is to try out a set of Forster bits if you are really getting serious about making wooden rings. You don’t need to spend a lot, and in fact I recommend only testing with a single bit that matches a common ring size that you make. When I first started using these bits, I bought a single bit that made rings that fit my finger size. It allowed me to make rings using the bits, as well as test them out myself. I wanted to see how they felt on my finger, so I could tell my customers from first hand experience. If you think you will end up using them, the kit prices are about the same as buying about three single bits usually. In that case, you might want to just pick up a small kit, and you will always have drills that you can use. There are a ton of drills in the world, and they are not all the same. Some drills are better for certain things than others. 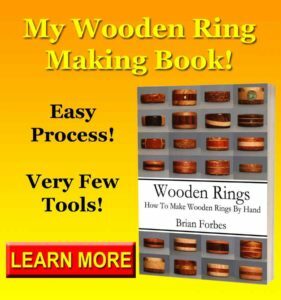 With making wooden rings, your best best is the Forster bit, and there are several reasons. First, a Forster bit makes a clean hole, with less sanding inside the ring. Next, it is inexpensive, and tracks exactly where you want it to go. The center spur grabs the wood, and the drill just follows the path that you decide. Lastly, these bits are able to be used for anything else that requires a hole of the same size. 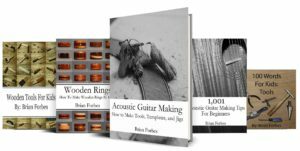 You don’t just have to use them to make wooden rings. Once you start using Forster bits, you will find uses for them all the time, and they will eventually become your go to bit for larger diameter holes.